Since it has been quite a while since we had spent Thanksgiving with the family, we were determined to do it this year. When your three children are distributed throughout the country in Philadelphia, Traverse City, Michigan and Los Angeles, all with families, it gets complicated. Happily, my daughter, Cathy, in Philly, invited all, but our baby, Hunter (31), had commitments with his wife’s family to celebrate a special birthday. My older son, Danny came with his two children, making four grandchildren in all. Penelope flew in from Santa Fe and I came from Detroit (more on that fair city next week). It was during the stormy days before Thanksgiving: in the middle of the country everything was delayed, but we were relatively lucky. Except for one of the roughest airplane rides I have had, I was only an hour late and Penelope one and a half. Lucky, because average delays at Philadelphia airport that night were 2 ½ hours. 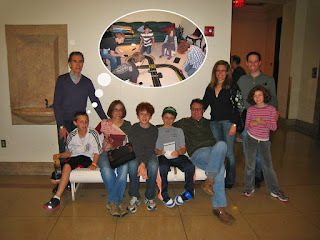 The day before Thanksgiving we went to the Philadelphia Museum and saw their relatively new Perelman Wing. It is situated, across the street, just opposite the main building. It has an Art Deco façade and was originally opened in 1927 as the Headquarters for the Fidelity Mutual Life Insurance Company. It is now totally renovated into offices with an addition of beautiful exhibition galleries. The galleries serve as the museum’s venue for contemporary exhibitions. When we were there, one was the work of Tristin Lowe, a Philadelphia artist who does somewhat surrealistic sculpture. 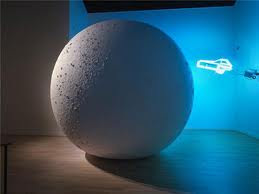 A whole gallery was given over to his work “Lunacy”, which is a giant moon 12 ½ feet in diameter consisting of an inflatable sphere covered in 490 square feet of white felt. In a dark room with wonderful lighting, it certainly felt otherworldly. Another exhibition was the work of Zaha Hadid, an Iraqi born British architect who has won the Pritzker Prize. The show was called “Form in Motion” and exhibited mainly her designs for the decorative arts such as benches, tables, cutlery and shoes, all in curvaceous forms. 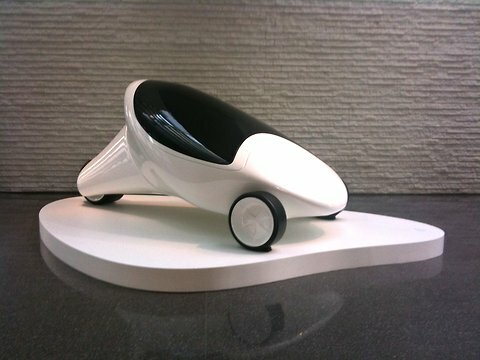 But in the entry to the Perelman building was her sculpture called Z-Car I. Across the street is, of course, the original great art museum, a legacy of the Centennial Exhibition of 1876. Its treasures are vast and fine including Medieval, Renaissance, Old Masters, Impressionists, 18th century and contemporary decorative arts to name some categories. We only had a chance to look at a few of these. We did, however, view a small exhibition titled “Dutch Treat”. It focused on feinschilder, Dutch artists of the Golden Age who painted, usually small, meticulously rendered images. The exhibition focused on paintings by Gerrit Dou from a private collection complemented by other artists with ceramics and glass of the period from Philadelphia’s holdings. For the Thanksgiving feast more parents and step-parents arrived, plus more siblings and cousins, until we were 20. Dinner, buffet style, included not just turkey, stuffing, and sweet potatoes with marshmallows cooked on top and veggies, but a member of the family also brought brisket and another brought meatballs. For desert there was fruit, cookies, brownies and several pies. We did not starve! The next day the children and grandchildren went out early to do some Black Friday shopping but bought little and in the afternoon we all went to The Franklin Institute, which is Philadelphia’s first class science museum. A staple there is the beating heart that you can walk through, the airplane pilot trainer you can ride in, and the sports area where you can learn things like what helps you to jump. We observed as the younger generations experienced all the above. That night we had leftovers. With great concern that there would not be enough the grandchildren made a platter of sushi that was large and tasty. On very full stomachs we headed back to Santa Fe the next day.